I am just still wondering how i Missed this. 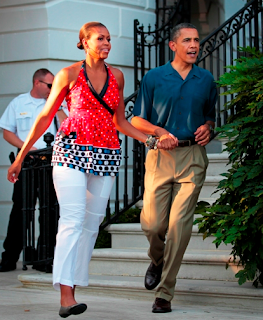 Michelle Obama was spotted twice wearing custom shirts from Suno . The reason why i said custom is because after much research I could not find anything in the suno collections Matching these shirts . Suno has become an household name in the states after being on the market for only a few years. I always mention in all my posts about Suno that even though the designer is not African i love the fact that the clothes are made with the help of the actual workers in kenya. Nothing bad to say about this line . You can check out Suno latest collection here. what are you thoughts ? do you Michelle Obama being one of the fashion icons of our generation can help with the rise of African fashion in the world? All she has to do is to wear one design from an african Designer. My first pick in that Category will be none other than Jewel by lisa ( very Sophisticated) . We love the both of them. It's great that Michelle Obama recognizes the abundance of beauty & fashion that Africa has to offer.